This bus uses the Clever Devices Turn Warning System to provide an audible warning to pedestrians when the bus is turning. As concerns about “distracted walking” increase, TriMet is teaming up with the Federal Transit Administration (FTA) to enhance pedestrian safety. The FTA awarded TriMet a $400,000 grant – $100,000 more than we requested – to conduct a comprehensive study demonstrating the effectiveness of a handful of pedestrian warning devices that alert people to the presence or movement of a bus. This demonstration comes at a time when “distracted walking” is beginning to draw as much attention as distracted driving. A nationwide study by Ohio State University released this summer found that injuries related to using a cell phone while walking more than doubled from 2005 to 2010 and, if trends continue, the number of injuries will double again between 2010 and 2015. For drivers, including our bus and train operators, distracted walkers have become a common sight in busy pedestrian areas such as downtown Portland. They often are so engrossed in their electronic devices they do not pay attention to the traffic around them. Last year, University of Washington researchers found walkers who were texting were four times less likely to look before crossing streets, stay in crosswalks or obey traffic signals. Soon, TriMet will begin using and analyzing five devices – four onboard systems and one fixed-location device. TriMet’s safety department initially planned to begin the demonstration of three devices in September, but with the additional money awarded by the FTA the department has expanded the scope, adding two other devices to the study. “Nothing will replace the awareness and diligence of drivers and pedestrians to prevent collisions, but the hope is that these secondary warning devices will create an additional layer of safety for people around our buses,” said TriMet’s Executive Director of Safety, Security and Environmental Services Harry Saporta. 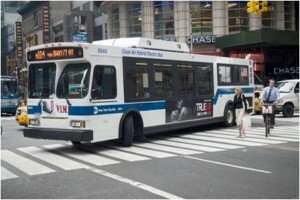 Protran’s “Safe Turn Alert” combines both an audible and visible warning. When the steering wheel is turned a minimum of 45 degrees, an audible alert outside the bus declares “pedestrians, bus is turning” and LED strobe lights on the side of the bus flash. The volume automatically adjusts based on the ambient noise level. For this demonstration, this voice alert and the others involved will only be in English. Listen to the audible warning being used by this device and others. The Clever Devices Turn Warning System uses a sensor inside the steering column. When the operator turns the steering wheel at least 45 degrees, the same audible alert, “pedestrians, bus is turning” sounds outside the bus in the direction of the turn. Sound levels can be automatically adjusted for day or night, or quiet zones. This system was developed by the transit agency in Richmond, Virginia. The verbal warning activates when the left or right turn signal is engaged, but will not activate if the bus is traveling at a speed of 35 mph or higher. This prevents the vehicle from warning pedestrians when changing lanes in the middle of the highway. The DINEX STAR LED headlight has an intelligent system that calculates the bus’s speed and steering wheel angle. It automatically turns on additional super bright LED lights inside the headlight pointed in the direction of travel. Operators can better see objects on the road directly ahead and pedestrians get a visual cue the bus is turning. 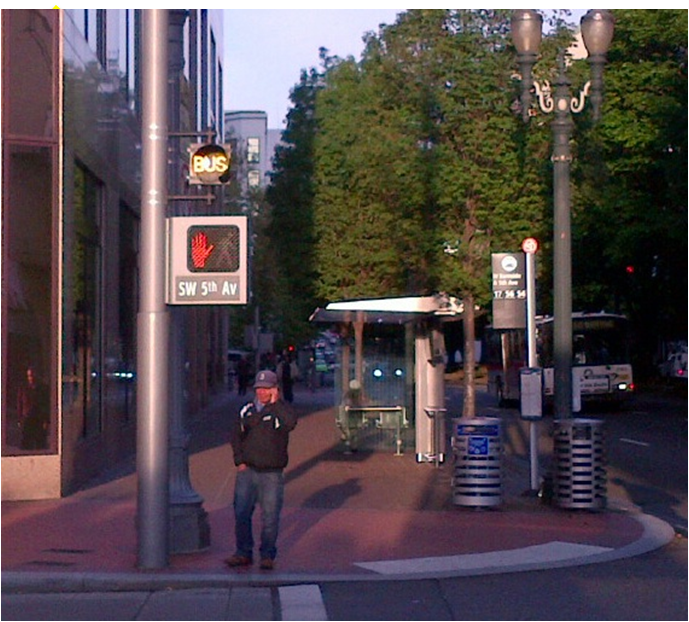 TriMet engineers created a sign in which the word “bus” lights up when a bus is turning. 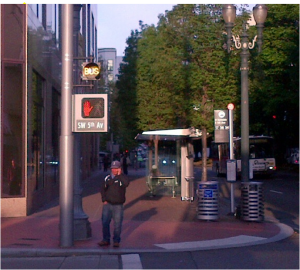 It is located at the intersection of SW 5th Avenue at Burnside Street and is positioned above the pedestrian walk/don’t walk signal. Eighty nine buses will be used in the demonstration, 51 with warning devices engaged and 38 without devices. At this time, the plan is to use the onboard devices on bus lines 8, 15, 17, 44 and 75. The fixed-location device is already installed at 5th and Burnside and will be turned on in mid to late November when the other devices go live. The project starting next month will analyze updated safety technology. We’ll be working with an industry peer review panel made up of transit industry leaders and will connect with other transit agencies about the use and effectiveness of the pedestrian warning devices. Bus operators, other TriMet personnel, riders and members of the community will be asked for their input as part of the overall assessment.